SVG Europe and Sky Sport Germany are delighted to announce that their long-term cooperation will continue with another edition of the acclaimed Sky Sport Summit on 27 June. The 2019 Summit will again take place at the broadcaster’s facilities in Unterföhring, Munich, Germany. Following on from a successful 2018 event that treated a capacity crowd to the latest insights into the German sports broadcast business and technologies, the 2019 summit promises a packed programme of panel discussions and presentations. Topics in 2018 included robotics and artificial intelligence, e-sports, set design, sports graphics and immersive audio. Speakers that participated in the 2018 summit included Prof. Dr. Gordon Cheng (TU Munich), Philipp Lawo (Lawo AG), Thomas Riedel (Riedel Communications), Daniel Url (Qvest) Media, Mike Ward (Reality Check Systems) and Arnd Paulsen (Dolby Germany). 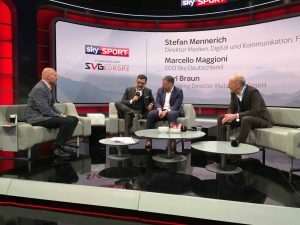 “The Sky Sport Summit in Germany is now a fixture of the busy annual SVG Europe calendar, and we can’t wait to return to Munich once more for what promises to be a fascinating insight into the many new and emerging technologies bringing about profound change in our industry,” said SVG Europe editorial director Fergal Ringrose. Topics for 2019 and registration information for the Munich event will follow closer to the event.